Welcome to an ideal getaway for guests visiting Frank Lloyd Wright's Fallingwater and Kentuck Knob, cyclists traveling the Great Allegheny Passage (GAP), whitewater enthusiasts rafting at Ohiopyle State Park, downhill skiers for nearby slopes or for adventures exploring nearby attractions. 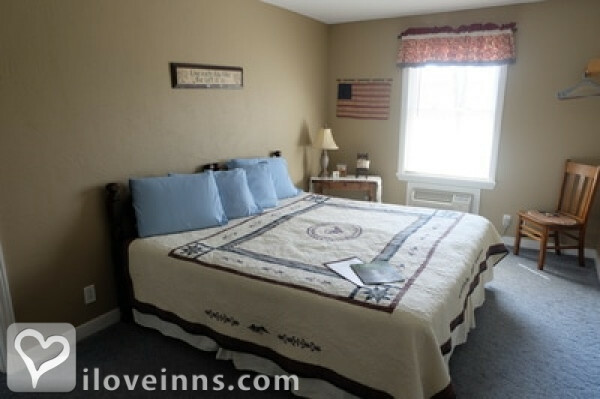 Five guest rooms featured, each room offers your choice of a king bed or two twin beds and private bathroom. The Americana Suite features two bedrooms and a spacious bathroom with a jetted tub. Cyclists are provided free shuttle service to the GAP trailhead in Connellsville, free use of washer/dryer and indoor bicycle storage. The lounge is a warm space to play a game of pool, try a puzzle, or watch a movie. 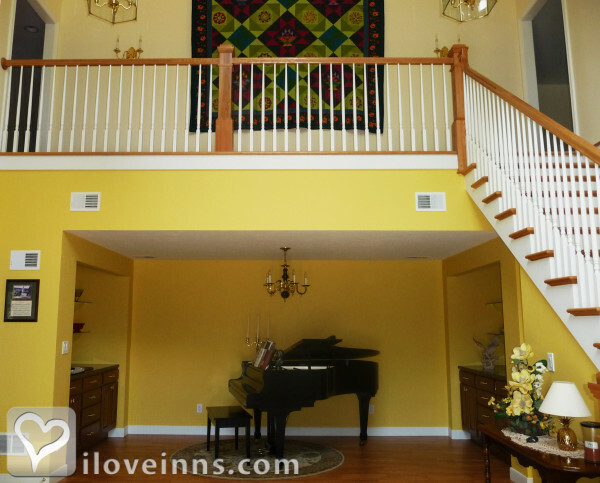 Guests are invited to tickle the ivories on the grand piano in the foyer. A complimentary hearty-homemade full-breakfast prepares guests to enjoy a full day of adventures or just sitting by the pond listening to the water fountain. Other facilities include a dining room, full kitchen, meeting/event rooms, and free WiFi. 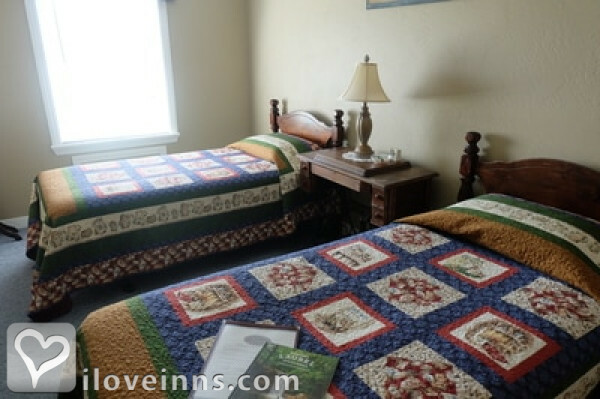 Custom weekend or weekday quilting and scrapbooking retreat packages offered and include the use of the spacious sewing and quilting classroom, meals, and uninterrupted time sewing or scrapbooking with friends. Payment Types Accepted Include American Express, Discover, Master Card, Personal Checks, Travelers Checks, Visa and Cash. This property has 5 total guest accommodations with private bath, 4 with hot tubs, 1 with whirlpool, 1 two-bedroom suite. The types of beds available include King and Twin. The Americana Suite consists of two bedrooms tastefully decorated in muted tones of red and blue with Americana and stoneware accents. Each room sleeps two and shares a spacious bath with a deep jetted tub and a separate tiled shower. Dressing room has a well lit twin vanity. You will enjoy your stay in this relaxing room with a country feel. Adjoining Stoneware Room completes the suite to sleep four. Each room provides the option of a King Bed or 2 Twin. Spacious bath with a deep jetted tub and a separate tiled shower. Room provides the option of a King Bed or 2 Twin. The Garden Room sports earthy gold, green and brown tones with quilts featuring large blocks with various garden flowers: poppies, gladiolas, daisies, dahlias, lilies, peonies, and hibiscus, hence, the name, The Garden Room. The private bath in this room has a unique tiled corner shower with 6 jets/body sprays, but no tub. Recessed lighting and a reading corner with pendant light and rocking chair. Room can be set with King Bed or 2 Twin Beds. The Magnolia Room is decorated in relaxing shades of mint green, cream, & black. Custom magnolia quilts and accessories are found throughout the room and private bath, which has a deep soaking tub and shower combo and a modern glass vessel sink. You can almost smell the sweet fragrance of magnolias when you enter this contemporary yet comfortably homey room. The Hydrangea Room is fully ADA compliant and is definitely a cheery room! Decorated in bright pinks, green and white, it boasts custom quilts with vibrant hydrangeas and butterflies. The tub and shower unit is equipped with multiple grab bars, a sliding shower head and optional shower seat if needed. You will feel like you are in a summer garden in this spectacular room. Cancel within 14 days of reservation date, deposit is non refundable. Cancel more that 14 days of reservation date, deposit is refunded less a $25.00 cancellation fee. The dates this property will honor the certificate are Anytime, November-March, subject to availability. This was my husband's and my first time staying at a B&B. Rick greeted us immediately upon arrival and showed us a very clean and quiet room. The beds were comfy and our room had its own air conditioner. A ground level entrance was provided for our use. The property has an outside fire pit and a pond stocked with koi and blue fish. Breakfast was fresh fruit, egg soufflé, toast, sausage, and yogurt. After breakfast, we fed the ducks and the fish by the pond. Based on our experience, we gladly would return. Love this place! Have now stayed here 2x! You will be welcomed with a fire in fire pit, soft lights, and s'mores and personal greeting by your host. You will be asked what would you like for breakfast; and it will be there the next morning, with delectable extras. (like baked apples). You will not leave hungry or feeling like you had no sleep. 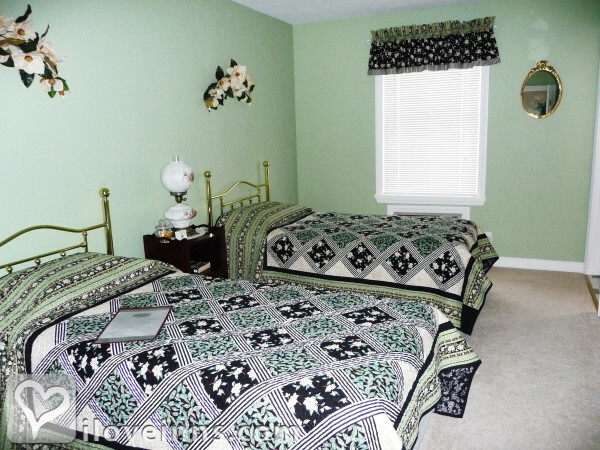 House is very inviting, comfortable, and homey with quilts galore. It really is like being at home, but without all the work and distractions! Donna and Rick really do make us feel so special. Our rooms were beautiful, comfortable and cheerful. Rick cooked wonderful breakfasts - melt-in-your-mouth waffles! We were able to sew to our hearts' content without the normal distractions of home. This was our second visit. We will be back! Rick and Donna were amazing, this place is the Best. Donna greeted us and showed us our room without an exhausting check in. Once we were settled, we were shown the grounds. After dinner, we enjoyed snacks by the fire. It was a beautiful evening. 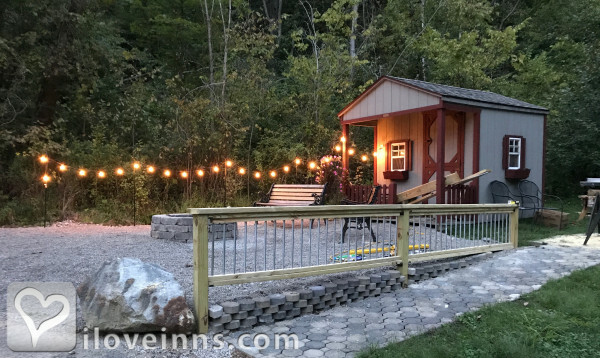 Stayed here on two occasions; greeted by a warm fire & soft lights around a fire pit, and friendly owners. Slept well in a clean, comfortable room, came out next morning to a wonderful, customized breakfast. You come as guests, and leaves as friends; just like their motto states. 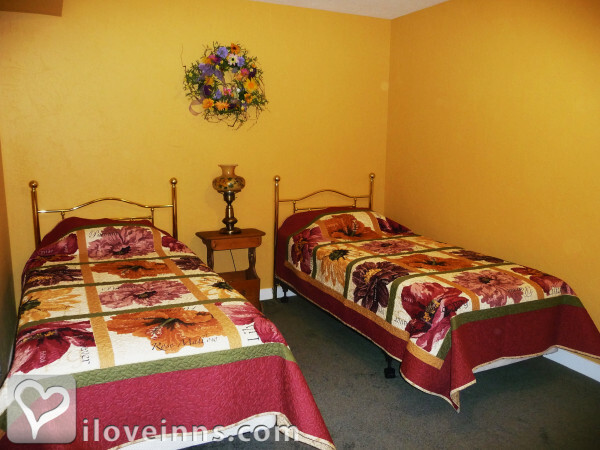 Place is very homey with homemade quilts on walls & beds; they're beautiful. Owners were great and place was 1st class all the way! Would highly recommend and I will stay again! This is our go-to place to stay when visiting Frank Lloyd Wright's Fallingwater and Kentuck Knob properties. 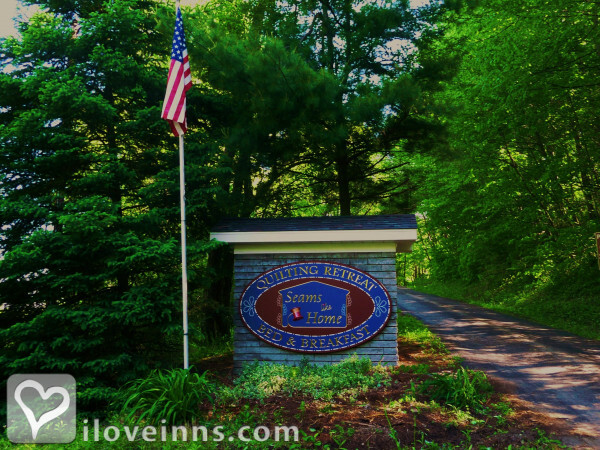 About 30 minute drive away, Seams Like Home provides a very comfortable, homey atmosphere, and hospitable hosts. 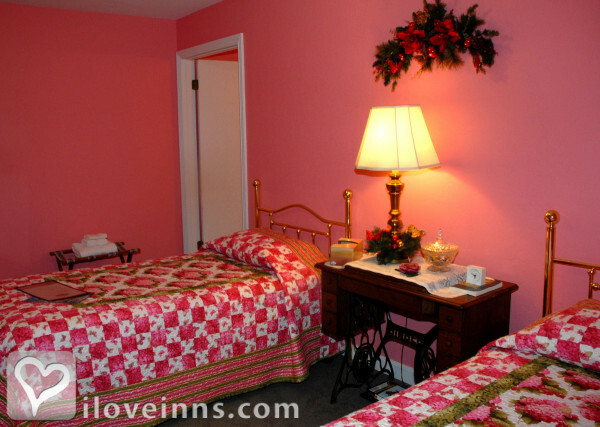 Each room is decorated around a theme, in great condition, and very clean! The open living area with comfortable seating, a pool table, and plenty of space is great for relaxing outside of your room. The property grounds are great for a stroll around the pond or to sit outside with a beverage and snacks and solve the world's problems (or not!). Breakfasts of cook to order omelets or waffles are a treat! Communication is fantastic, Rick keeps in touch and is willing to help you out and make great recommendations! His son Aaron and Wife couldn't be any nicer too! Thank you, we will be back! We enjoyed our stay at Seams Like Home. Our only complaint was that our shower attachment leaked and did not work very well. 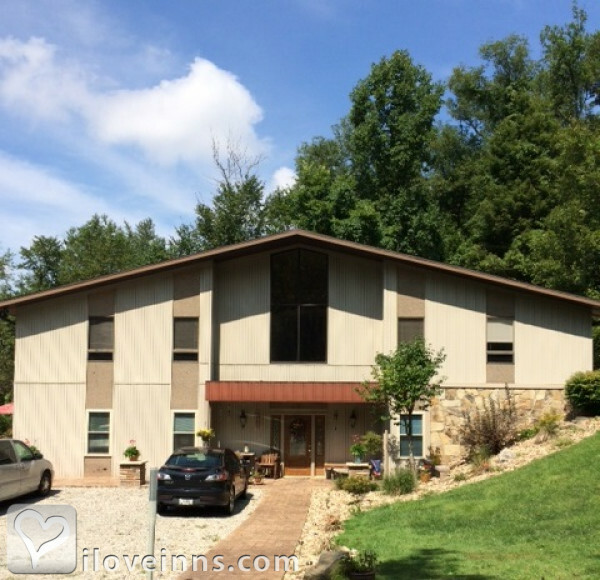 We liked all of the other amenities and enjoyed the quiet, peaceful nature of the property. We were biking the GAP trail and stayed here one night. The host picked us up in town. The rooms were very comfortable. I loved the home-made quilts. The breakfast was delicious. In the morning he drove us back to town to continue on our trip. I would definitely stay again. The Very BEST B&B We Have Ever Stayed At!! The owners were outstanding, the breakfast was fabulous, and the accommodations were extraordinary. We spent the night in Connellsville, Pa while riding the GAP trail Seams Like Home is a few miles out of town but Rick picked us and our bikes up. The rooms were great and breakfast was incredible. Rick was informative and gracious. Would definitely stay there again. Highly recommend. We took a mid-stop to break up our trip [NY to IL] and go to Falling Waters. It was a pleasant night stay at Seams. The owners were friendly. The place was clean. We had a complete, home cooked breakfast. The rooms are separated from the owners’ living space and the guests have their own common area for playing pool, watching TV, cooking, etc. The home is nestled in the woods with exotic ducks floating in the pond. All in all, it was quite the restful break that we needed. Very nice place to stay. 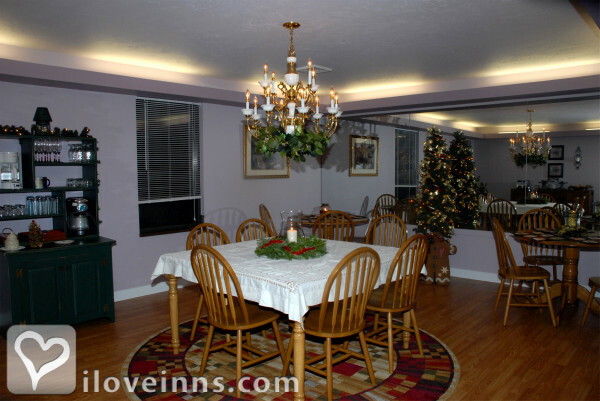 The owners are very friendly and attentive to your needs. The breakfasts were outstanding. Stay here if you would like to bike the Allegheny trail! My stay at Seams Like Home was a bit of a miracle. My girlfriend and I had decided to bike as much of the Allegheny trail as possible on very short notice. The decision was made on a Wednesday but most of the planning went into driving to Pittsburgh and preparing our bikes. Since the trail wish very active with bikers over the summer it was hard to find a vacancy at one of the inns along the way. Luckily, Seams Like Home was able to provide a room for at their lovely oasis. What's more is that while biking we became very tired and were not going to be able to make it to our planned destination, but Rick was able to come pick us up and shuttle us back to his bed and breakfast. We were so grateful. R once at the inn Rick provided amazing service. We were free to use the lounge area which came complete with satellite tv, pool table, and much needed comfortable couches after a long day of biking. One thing I noticed is every room had its own bathroom and some even came with a Jacuzzi! The next morning we were punctually served waffles, eggs, fresh fruit, bacon, Orange juice, and coffee to fuel up for our next day of biking. All in all, my girl and I were very happy to have stayed at Seams Like Home and will definitely stay there again if we ever try to bike the trail once more. My little boy and I stayed here for a couple nights. 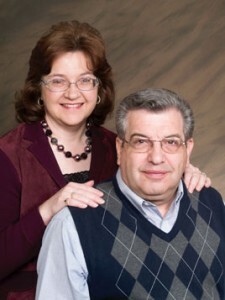 Rick and Donna were so welcoming and kind. They went out of their way to make our stay excellent! Will definitely visit again. We had an early tour at Falling Water and our hosts were most accommodating by preparing an early breakfast for us. Rick was very accommodating, even meeting us when we had navigational issues, and making his TV available for an important Stanley Cup hockey game. We would recommend "Seams" highly for anyone visiting Fallingwater. Very nice and warm host couple Rick and Donna. Ingenious decorations, and clean, modern room and utilities.